Long Wave Utility Band antenna offers high sensitivity and narrow bandwidth across the band. Use this antenna to listen to frequencies below the AM broadcast band. Directional to help reduce interference when 2 stations from different directions are on the same channel. Ideal for lightning detection applications in the range of 300 KHz - 530 KHz, this frequency range is filled with continuous static when severe thunderstorms approach. Monster-size 6.75 inch long x 1.02 inch diameter ferrite rod core for maximum reception. Part Number: 6LF300K530KBC is a Long Wave Utility Band antenna for 300 KHz - 530 KHz, and can be user tuned with external variable capacitor user supplies. If you chart plot any distant steady beacon in this band, (or even the average static from storms 300 miles out) you will see a very sudden sharp drop near sunrise, as the sunlight first hits the ionosphere. This band is extremely sensitive to ionosphere changes, and it can be used for various types of research. Specification: (+/- 10 %), 932 pF tunes @ 300 KHz. NOTE: Antennas are 9 inches long. NOTE: These antennas are bi-directional having a 'figure 8' pattern. Long Wave Broadcast Band antenna offers high sensitivity and narrow bandwidth across the band. 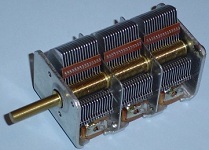 The Long Wave Broadcast Band of 150 KHz - 300 KHz is not used for broadcasting in the USA but you can hear LW stations from the other countries during times of good reception. In the USA, the band is used for low power air navigation beacons and utility point-to-point communications. Use this antenna to listen in to what's below the AM broadcast band. Part Number: 6LW55BC is a Long Wave antenna for 150 KHz - 300 KHz, and can be user tuned with external variable capacitor user supplies. If you chart plot any distant steady beacon in this band you will see a very sudden sharp drop near sunrise, as the sunlight first hits the ionosphere. 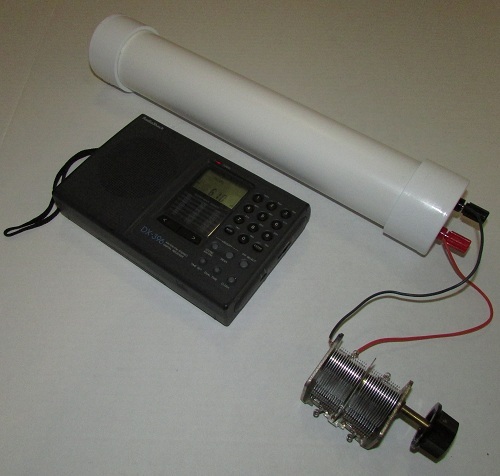 This band is very sensitive to ionosphere changes, and it can be used for various types of research. Specification: (+/- 10 %), 932 pF tunes @ 150 KHz. 275 pF tunes @ 300 KHz. LF Band antenna offers high sensitivity and narrow bandwidth. Part Number: 6LF115K210KBC is a Low Frequency antenna for 115 KHz - 210 KHz range, and can be user tuned with external variable capacitor user supplies. Specification: (+/- 10 %), 1400 pF tunes @ 115 KHz, 1000 pF tunes @134 KHz ( RFID band ). 400 pF tunes @ 210 KHz. Part Number: 6LF75K140KBC is a Low Frequency antenna for 75 KHz - 140 KHz range, and can be user tuned with external variable capacitor user supplies. Specification: (+/- 10 %), 1400 pF tunes @ 75 KHz, 1000 pF tunes @ 90 KHz, 400 pF tunes @ 140 KHz. Great for receiving time signal station WWVB 60 KHz. High sensitivity and narrow bandwidth. Part Number: 6LF50K90KBC is a Low Frequency antenna for 50 KHz - 90 KHz range, and can be user tuned with external variable capacitor user supplies. Have a watch or clock that does not receive WWVB due to weak signal? Use this antenna to greatly boost the signal. Tune up the antenna and lay the watch next to the antenna overnight to receive signal. Broadside of the antenna should face toward station WWVB in Colorado, USA. Specification: (+/- 10 %), 1400 pF tunes @ 50 KHz, 1000 pF tunes @ 60 KHz WWVB. 400 pF tunes @ 90 KHz. Part Number: 6LF30K50KBC is a Low Frequency antenna for 30 KHz - 50 KHz range, and can be user tuned with external variable capacitor user supplies. This frequency range allows detection of lightning over 2000 miles away. 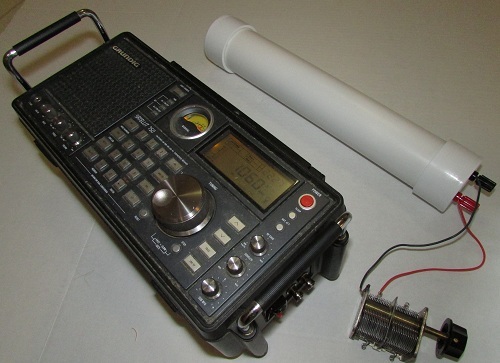 Works with all types of Long Wave Radios Greatly boost reception! Simply tune the antenna and place the radio nearby for signal transfer to the radio's built-in barcore antenna element. Bring back receiving power to your antique Long Wave radios! No wire connection or modification needed, simply place the radio near the tuned antenna for greatly increased signal strength. No batteries needed. The tuned antenna captures the radio waves and transfers them to your radio's built-in barcore antenna. 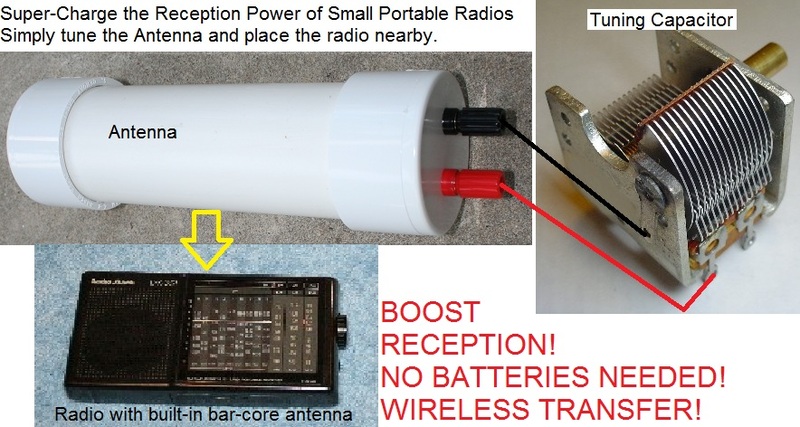 Simply place the radio near the antenna, adjust variable capacitor to tune in station for a great boost in reception strength. You can also match and tune a random long wire antenna to your radio's 50-ohm or 300 ohm input. For 50 ohm match wrap 2 or 3 turns around the tuned up antenna. For 300 ohm match wind 8 or 9 turns around the center of the tuned antenna.